Grammy Award nominated jazz guitarist Chuck Loeb is the latest marquee artist to have joined the teaching roster of ArtistWorks.com, a first-of-its-kind online music and art campus that provides members with personalized interaction with acclaimed musicians and artists. Tens of thousands of members in nearly 100 countries have improved their playing within ArtistWorks’ unique online learning communities, which combine unlimited access to hundreds of pre-recorded lessons with the ability to get video feedback from world renowned teachers. There are 25 different online schools—everything from bluegrass, rock guitar and bass, to violin, flute, voice and banjo—taught by world-renowned teaching artists like Paul Gilbert, Nathan East, Mike Marshall, Tony Trischka, John Patitucci, Howard Levy, DJ Qbert and others. Unlike other online video tutorials, which are one-way, teacher-to-student delivery systems, ArtistWorks’ patent-pending Video Exchange™ Feedback Platform represents a new model of personal interaction between members and teachers, which is supported by the near ubiquity of mobile technology. The powerful platform allows beginning and seasoned members to submit practice videos to their teacher using a smartphone, tablet or computer. Their teacher then reviews them and responds with his/her own video containing personalized feedback and additional instruction. These Video Exchanges are paired together on the site and made available for all members to learn from, creating a constantly growing, ever-evolving virtual master class online. Loeb’s new online school simplifies complicated modes and scales, and makes jazz improvisation accessible to guitarist from all genres. Loeb, whose career has spanned more than four decades and who plays guitar in the contemporary jazz group Fourplay, says the ArtistWorks platform is liberating for time-strapped teachers and students alike, allowing instructors to be more precise and efficient, eliminating the prospect of meandering, unfocused lessons. ArtistWorks membership starts as low as $90 for three (3) months. 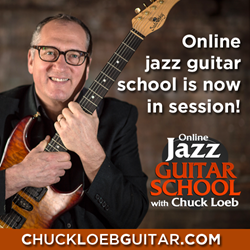 For more information about the new Online Jazz Guitar School with Chuck Loeb, visit chuckloebguitar.com. For more information about ArtistWorks, visit artistworks.com. In 2008, former AOL executive David Butler set out to finally master jazz guitar. With no acceptable teachers in his area, he built a revolutionary online system to enable anyone to get direct feedback from a master teacher anywhere in the world. Founded by David and former financial executive Patricia Butler, ArtistWorks, Inc. is the leader in a new generation of online learning platforms. This “next generation” Video Exchange™ Feedback Platform enables world renowned artists and musicians to “teach the world” by presenting their artistic legacy in the form of HD video lessons and direct feedback to subscribing students. Utilizing simple web cams, smartphones, tablets or video cameras, students are able to submit practice videos and get individualized video feedback and guidance from their teaching artists - creating a constantly evolving two-way, online learning experience. ArtistWorks currently offers schools from such world-class artists as: Paul Gilbert (rock guitar lessons), Martin Taylor (fingerstyle guitar lessons), Chuck Loeb (jazz guitar lessons), Jason Vieaux (classical guitar lessons), Nathan East (electric bass lessons), John Patitucci (jazz bass lessons), Andreas Oberg (gypsy and jazz guitar lessons), Jeannie Deva (singing lessons), Nathan Cole (violin lessons), Jeffrey Khaner (flute lessons), William Caballero (French horn lessons), David Bilger (trumpet lessons), Ricardo Morales (clarinet lessons), Howard Levy (harmonica lessons), DJ Qbert (DJ lessons), Christie Peery (piano lessons), Luis Conte (percussion lessons), as well as the ArtistWorks Academy of Bluegrass with Tony Trischka (banjo lessons), Missy Raines (double bass lessons), Bryan Sutton (flatpick guitar lessons), Andy Hall (Dobro lessons), Mike Marshall (mandolin lessons), Darol Anger (fiddle lessons), Free Acoustic Guitar Lessons with Scott Law, and Justin BUA (art lessons). For more information, visit ArtistWorks.com.